Derby’s unique thick-walled construction makes our HDPE fencing the sturdiest and safest of all polymer fences available on the market. Thick side walls and internal ribs add strength and firmness to our HDPE horse, farm, livestock, cattle, ranch and pasture fence products and eliminate the need for, and cost of, internal reinforcement with other materials. Our internal ribs differentiate us from our competition and and will not become brittle even at 60 degrees below zero and will absorb the impact of a full extended leg kick from any breed of Equine or Bovine. 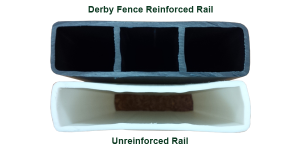 Another unique feature of a Derby Fence is our special galvanized “rail button locking system” which securely contains animals while remaining easily removable by the owner to allow access for tractors and other equipment. Derby offers the safest and most beautiful HDPE horse fencing available. 100% made in the USA with a twenty-year warranty. The best choice for safe, durable & maintenance-free fence for farms & argiculture in all locations and climates. Derby’s thick-walled HDPE construction makes it the sturdiest and safest option to contain livestock in extreme climates. Your cattle will be safe inside our HDPE fence products and you will be choosing an environmentally friendly fencing option. From ranches to suburban developments, a Derby Fence is the perfect choice for safe, durable & maintenance free fencing. Derby Fence blends beautifully with any architectural style and is a great way to add a touch of elegance as a perimeter fence. Our durable HDPE fencing is safe for containing all types of livestock and pets. Derby Fence will not splinter or cause injuries. Derby Fence is one of the toughest plastic fencing solutions on the market. The posts and rails have twice the wall thickness of most PVC fencing. Derby’s beautiful 4-rail HDPE equine ranch fencing is perfect for horses, cattle and other livestock with tighter spacing between the rails. This is the ultimate all purpose equine ranch fencing.